S-Line Series with integrated EPSON® printer! 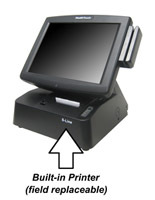 The 12" S-Line stands 14" tall and 12" wide , and will free up the space beside your POS terminal by eliminating the need of an external printer. You can now use this space to generate additional revenue by displaying advertisements or selling merchandise. 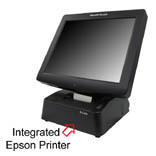 The 17" S-Line redefines the all-in-one design by integrating an EPSON® thermal receipt printer into a touchcomputer.It takes the most commonly used paper size: 80mm (3 1/8") wide by 80mm (3 1/8") diameter. Self-Service Kiosk, Retail, Casino Player Tracking, Industrial, Hospitality, Healthcare, Digital Signage, and many more. Product configuration is simple with our tools. Click on the logo to start building a unit to your specification. Please contact Pioneer POS regarding warranty information.